When I saw this shirt I just had to order it. 1) Dinner at Roscoe's House of Chicken 'N Waffles. We drove around for awhile before I noticed this little hole-in-the-wall restaurant that had a name I recognized. I shouted to Dan, "That's a famous place!" (Maybe it's only famous in Los Angeles, but I'd heard a lot about it.) So we had a lovely, if unconventional dinner of fried chicken and waffles at Roscoe's. It was delicious! Very unique and memorable. 2) Richard Cheese concert at The Derby. Richard Cheese is a satirical lounge singer who performs songs from various genres (rap, rock, etc.) all in one particular style. Lounge-singer style. Dave Berman was kind enough to get us tickets to the show and it was an interesting experience. Dan really enjoyed the concert, so it was a successful evening since that was the point of going. 3) Celebrity sightings of Kato Kaelin and Dennis Haskins. Richard Cheese had to point out Kato Kaelin (aka that guy from the OJ Simpson trial) in the audience, but I recognized Dennis Haskins (aka Mr. Belding from Saved by the Bell) on my own. They were sitting at a table right next to us, but we probably wouldn't have noticed them otherwise. Even in LA you don't see celebrities (even extremely washed up ones) very often, so spotting these guys standing next to us at a concert added yet another dimension to our multi-faceted evening. Before I start washing the dishes that have been piling up in the sink all week, I thought I'd write about the very entertaining day Dan and I had yesterday. 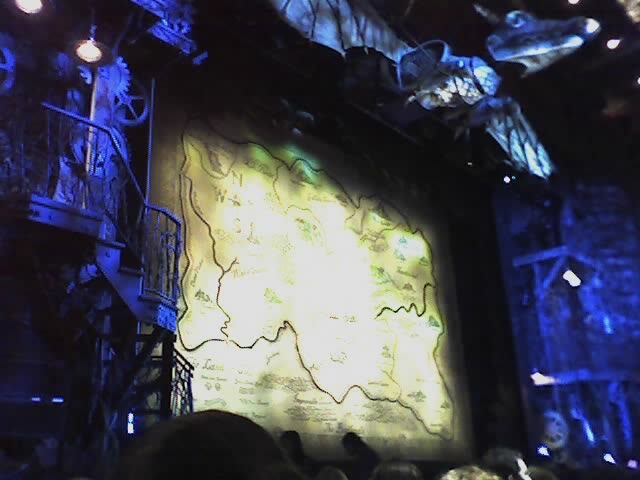 First, we went to the matinee of "Wicked" at the Pantages Theater in Hollywood. I've been wanting to see the show for a long time and I wasn't disappointed. It was amazing! Dan bought the tickets back in October when they went on sale and we had great seats in the orchestra section about seven rows from the stage. We weren't supposed to take pictures inside the theater, but I took the above photo surreptitiously with my cell phone while there weren't any ushers around. Needless to say, I loved the musical and I even bought the soundtrack later in the evening before we left Hollywood. Second, after dinner at Miceli's, our favorite restaurant in Hollywood, we went to Mann's Chinese Theater to see TMNT. Dan and I are part of the original Teenage Mutant Ninja Turtles generation and I remember seeing the first movie in the theater in 1990. We both hoped that this latest rendition would remain faithful to the original turtle story! Dan liked it, at least, and that was all that mattered. Third, to end the evening, when Dan and I got home we watched the Casino Royale DVD I bought earlier in the week. It was a long day, but we really enjoyed it. Plus, this is the first weekend in March that we've spent at home so that has made it even better. ETA: Let's welcome the Florida Gators to the Elite 8! "Dan and I watched The Prestige last night in our luxurious Motel 6 room. We really liked the movie, but about halfway through I was really confused. So Dan paused the movie and tried to explain what had happened so far. His explanation went something like this, 'So there's these two young magicians, Batman and Wolverine. They're trying to kill each other because Batman killed Wolverine's wife and then Wolverine shot Batman in the hand. So Wolverine goes to Colorado to get help from Jareth and Golum.' This all stemmed from the fact that it was easier to refer to the actors by their famous roles in other movies - Christian Bale in Batman, Hugh Jackman in X-Men, David Bowie in Labyrinth, and Andy Serkis in Lord of the Rings. And since we couldn't remember the names of the characters in the current movie, it was just easier to use the names we are more familiar with. So at the end, we tried to answer the question of which magician came out on top in their feud. Dan's answer, 'Well, there's only one dead Batman and like a hundred dead Wolverines, so I guess Batman wins.' It was really funny, but you might have had to be there." Before I get around to writing about anything recent, here's a picture I took with my cell phone a while back. Dan and I went to Miceli's, one of our favorite restaurants, while we were in Hollywood last September doing some Halloween shopping at the Hollywood Costume Shop. It's an authetic-style Italian restaurant with empty Chianti bottles with people's names written on them hanging on the walls and ceiling. So last September Dan and I added a bottle of our own to the decor. We hadn't brought a regular camera with us that day I used my cell phone to take this picture. I know it's a pretty grainy photo, but I'm glad I took it anyway. Last night was the first chance I've had to sit down at my computer, but I was too tired and lazy to actually write anything to post here. I worked late and then went to the gym for the first time since last Tuesday (3/13) so I was exhausted when I got home. Here is a list of topics of the posts that I am working on. I'm planning to spend the evening relaxing at home so I'll definitely post something on these items later. Yesterday morning when I got to the airport, around 5 AM, I discovered that my driver's licence has expired. This meant I had to go through a special security screening before I could get on my flight. That wasn't such a big deal, but not having a valid licence also meant that I couldn't get my rental car when I arrived in DC. I took the airport shuttle to my hotel, but I still felt really stupid for not noticing that my licence was expired. Sam and Dave were nice enough to pick me up at my hotel and take me to dinner tonight. Thanks guys! If I'd had a car of my own I could have met them somewhere better than the horrible restaurant we went to. It was highly recommended my the hotel staff, but our experience there was less than spectacular. The entire flight to DC I was worried that it was going to be cold there and that I hadn't brought any warm clothes. But when I arrived in DC it was 85 degrees! In fact, it was a record high and I was a bit warm in my sweatshirt. Then I checked the weather for the rest of the week and discovered that it was going to cool down dramatically. There's even a chance of snow tomorrow morning. Like I said in my earier post, I didn't have the foresight to bring a winter jacket with me and the last thing I'm prepared for is snow. 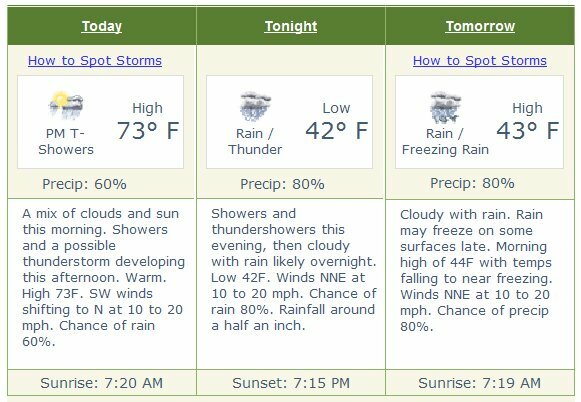 Fortunately I won't have to be outside much tomorrow, but I'll definitely be freezing when I am. Then, after my meeting tomorrow afternoon, I'll get on a plane to Phoenix where it's almost 100 degrees! Those shorts I packed for the weekend should come in handy. 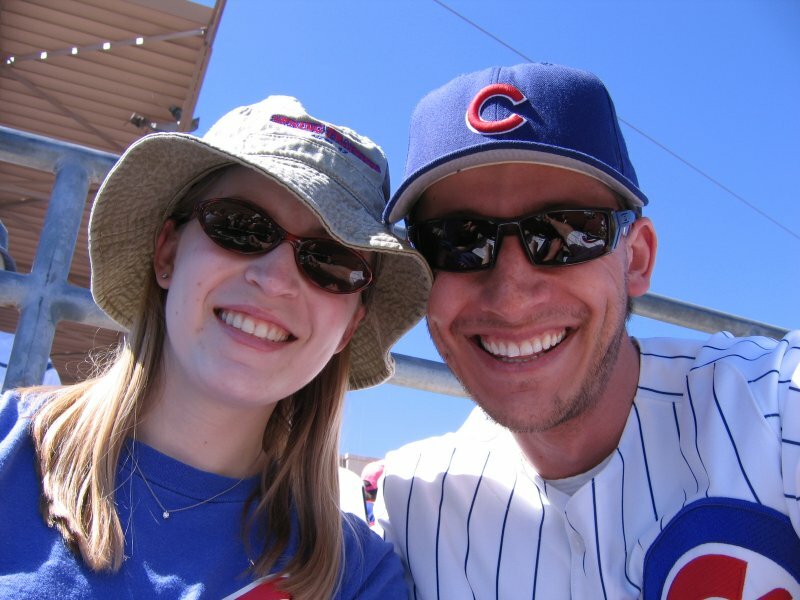 We won't have internet access in Phoenix over the weekend (we're staying in a Motel 6), but Dan and I will be going to two Cubs games while we're there. We even have tickets for a game on St. Patrick's Day that should be a lot of fun. When we get back I'm sure I'll have plenty of stories and pictures to post. I have to get up early for my meeting so I'd better get to bed. Goodnight! It was 80 degrees yesterday, but tomorrow there's a chance of snow. And which Los Angeles resident (originally from Florida) forgot to bring a jacket because it never gets that cold where she lives? I'm leaving on a business trip to the DC area in the morning. But I'll have my computer with me so expect another post when I get there tomorrow. 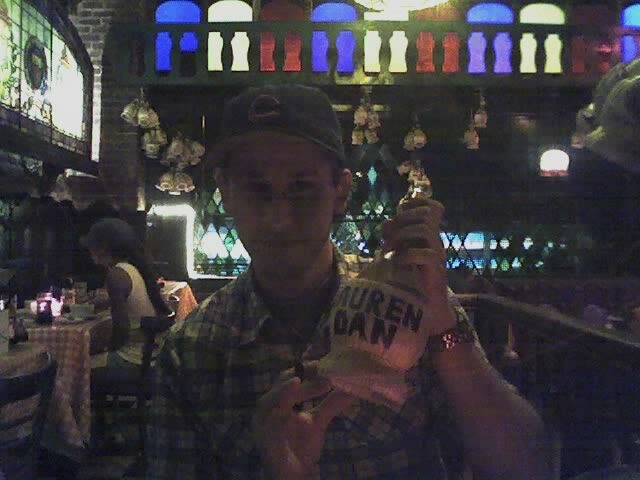 By the way, Dan got back from his bachelor party safe and sound yesterday. All's right with the world. I stayed home from work this morning to try and buy tickets for the Staples Center Police concert on June 20th. But by the time I got through on the Ticketmaster website, the best tickets available were behind the stage. For $100 apiece Dan and I could stare at the back of Sting's head. Needless to say, I didn't make the purchase. I thought the Las Vegas show tickets were only for backup, but I'm glad I bought them now. It looks like Dan and I will be going to Las Vegas on June 15th! And we'll be sitting in front of the stage! I guess it's time for me to go to work now. Phooey. Dan left for his bachelor party at Lake Tahoe on Friday so I have the house to myself until he gets back tomorrow night. So how have I spent my time so far? On Friday I worked until 8, went to the gym after that, came home and went to bed at 11. And yesterday after I bought the Police tickets, I went to the gym, then came home and watched all the TV shows I've been TiVoing for the past week. I know it doesn't sound exciting, but I've been really enjoying myself. This morning, after I called the LA Times because I didn't get my newspaper again, I went shopping at South Coast Plaza. 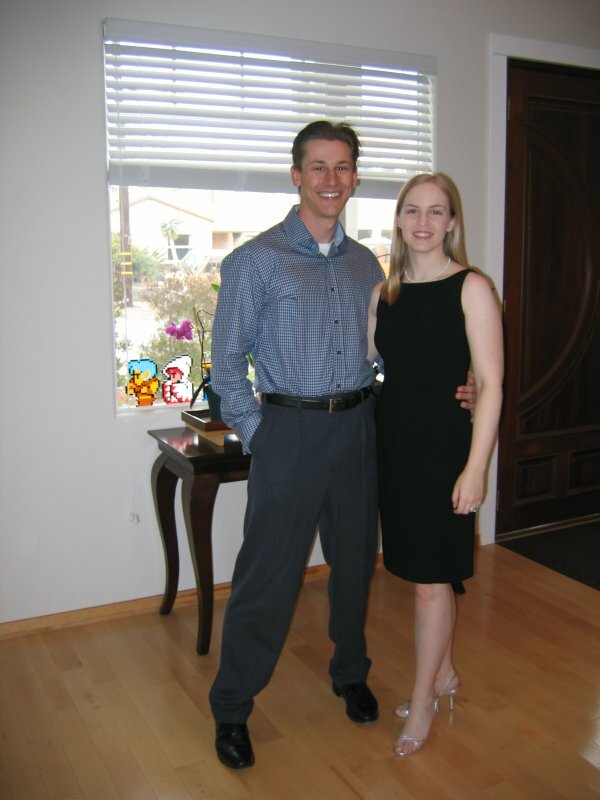 Dan and I are going to see "Wicked" at the Pantages Theater in two weeks and I want something new to wear. Unfortunately I didn't find anything. I don't know how I'll spend the rest of the day, but I'm sure it will be thrilling! To me, at least. When we thought our only chance to see The Police was shot (see as how it is the same day as our wedding), Dan wrote this letter to Sting. I guess we won't need it anymore! My fiance and I are getting married on the date you plan to play Dodger Staduim this year. This is problematic for us. We would really like to see you and your Police play, but we are getting married in San Diego on that date. Is there any chance you would relocate your venue to our reception room? It holds about 80 people. We'd be happy to provide you and your band food and drink (limit 4 people), and we could pay you up to $500. Please let us know if this is amenable to your and your band. One way or another Dan and I will be seeing The Police in concert this summer because I just bought tickets for the Las Vegas show at the MGM Grand on June 15th! While we would rather go to the concert at Staples Center on June 20th, the tickets for that show don't go on sale until Monday and even then there's no guarantee I'll be able to get any before they sell out. Even though I bought the Vegas tickets four minutes after they went on sale to the general public, the seats I got are terrible. I don't think they could be much farther away from the stage. But you don't get a chance to see The Police everyday so I'll take whatever chance I can get! Our rooms at the Motel 6 did not have internet access (no surprise there) so I was not able to post another update while we were at Big Bear last weekend. The only reason I was at the Big Bear Library on Saturday was to purchase Cubs tickets that went on sale that morning. I knew the public library would have free internet access and that it is located just a few blocks from one of the Snow Summit offsite parking lots. So after I was finished snowboarding for the day I took the shuttle to the parking lot, walked over to the library, and used one of their computers to buy Cubs tickets for May 23 at Petco Park in San Diego, and May 25 and 27 at Dodger Stadium in Los Angeles. I must have looked silly at the library in all of my snowboarding gear, but at least I got the tickets. 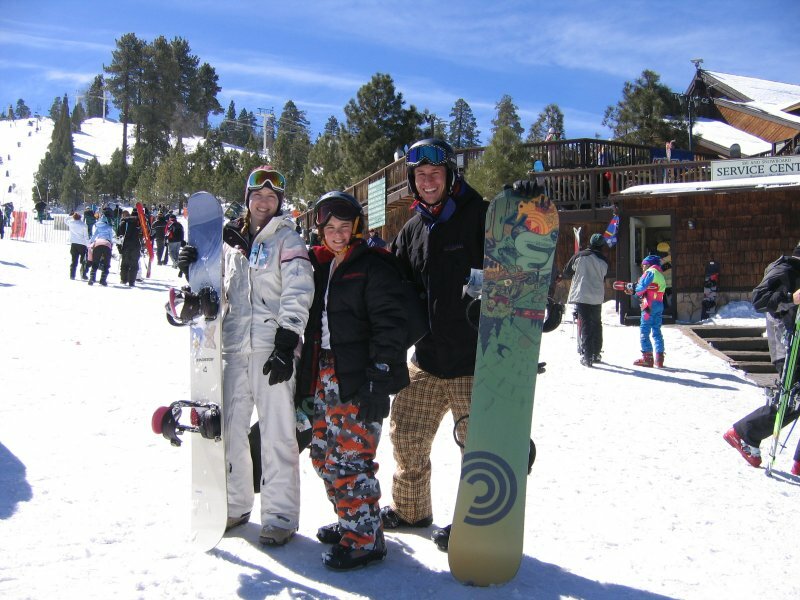 As for the rest of the weekend, my snowboarding wasn't too terrible! It turns out that our dryer is fine. The only problem was that the vent on the outside of the house was closed. Go figure. I didn't get a chance to write about our washer and dryer ordeal before we left for Big Bear, but now I'm home in the middle of the day waiting for a repairman and I've got the time. So the new appliances were delivered and installed on Thursday and I already had two loads of laundry lined up for them. The installer turned on the washer and dryer to make sure they worked, but he only left the dryer on for a few minutes before declaring that it was functional. Unfortunately, as soon as I tried to actually dry some clothes I discovered otherwise. The dryer just doesn't get hot. Needless to say I was extremely disappointed that our brand new dryer didn't work. So on Friday I called Home Depot, the installer, the manufacturer (LG), and a local repair company before I could get someone to come look at the dryer. And I couldn't get anyone to admit that the dryer malfunction was their fault. Maybe I'll find out what the problem is when the repairman gets here. And maybe I'll be able to dry clothes too! The Police are playing at the Staples Center on June 20th! Tickets go on sale on Saturday for the Las Vegas show (June 15) and on Monday for the second Los Angeles show (June 20). Maybe there's still hope! More pictures are available in the "Big Bear 3/07" set of my Flickr photo album. More details to come. I'm posting this from the Big Bear Public Library! If we can get internet access later tonight I'll post an explanation and some pictures from our day on the slopes. I'm at home today waiting for our new washer and dryer to be delivered. Although the delivery is scheduled for the afternoon, I took the whole day off because I also needed to get a crack in my windshield repaired. A rock hit my car while I was driving to work on the freeway last Friday, but I didn't notice the crack until it had gotten a bit larger. Fortunately the crack didn't spread very far so I could just get it sealed rather than replace the whole windshield. The repairman has already come and gone this morning so now I need to get started on my other chores. I really hate cleaning the house, but it has to be done. At least I can look forward to doing laundry with my new washer and dryer when they arrive. Life is good!